Had I known how the events of last year were going to flip my life upside down, I would have been far more nervous about embracing my #OneWord. I probably would have been very wary of the whole concept. And 2016 undoubtedly was full of un-binding. So much so that I couldn’t even begin to list examples. Every bit of the growth required from becoming unbound was beneficial, though often painful. Growing pains are real, y’all. Last year also brought a secondary word with it—brave. All year long, people told me I was brave, encouraged me to keep being brave. But being brave is hard because it mostly means doing things afraid—with your heart threatening to march out of your chest, your knees knocking, and your stomach turning flips. Frankly. I got sick and tired of being brave. 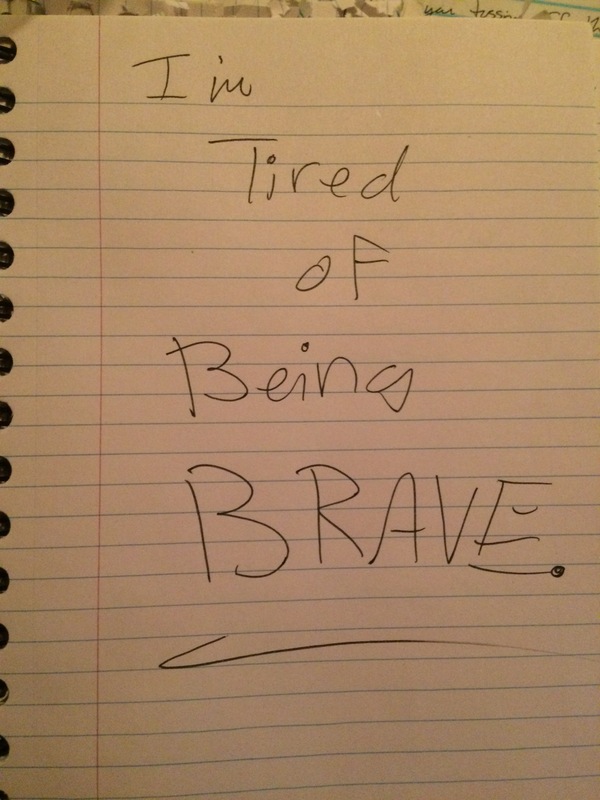 There’s a page in one of my notebooks where I scrawled in large, frustrated letters “I’m tired of being BRAVE” after someone sent me a text telling me I am brave. I was DONE with brave by the time December rolled around. 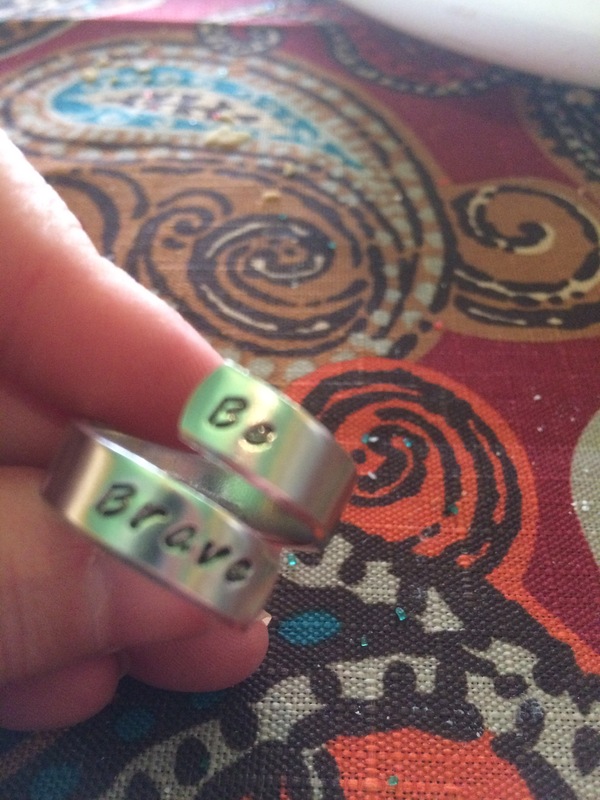 This ring, that phrase from the bravest person I know right now—my sister who is fighting a ridiculously rare cancer and all that it brings with it. Those two words inscribed on a piece of metal that sits wrapped around my left pointer finger on a daily basis have given me permission to continue living unbound—even when it means doing so in Texas rather than South Carolina. In my Unbound blog last year, I referenced the story of Lazarus being raised from the grave. Can you imagine him awakening to the grave clothes binding him? Did he have to be loosed from them? Did they fall off on their own? I don’t know. But the image that came to mind as I asked God for an explanation of “unbound” was of Lazarus being shed of his grave clothes. Strips of cloth being loosened from his wrists, falling from his head and around his shoulders, piling around his feet. He was unbound from death. I was being unbound from fear, anxiety, depression. That kind of freedom is exhilarating, for sure—but it requires walking in a new way and changing how you’ve thought about the world around you. When you’re stuck in darkness and suddenly there’s a glorious light filling the space you’ve occupied for a significant amount of time—you squint; you allow your eyes to adjust to the brightness. It seems as though I’ve been squinting an awful lot over the last year—staring at brilliantly lit truths that have been revealed until my eyes have adjusted to the reality—truths that reveal who God is and how He sees me as His daughter. As the new year approached, I was actively seeking my word for 2017. Within a few days, I thought I’d found it, but I didn’t tell anyone. When I got back to Texas, Anna asked me if I knew what my word was. “Brave,” I exasperatedly spit out. It fit. I’m going to need some brave this year. But as the first week of 2017 passed, it didn’t feel like it was quite the right word. I made lists of words that came to mind. I looked up their meanings, their origins. None of them stuck. I stopped trying to figure it out. I thought maybe brave was it after all. Then a few nights ago, I was sitting at the kitchen table and it struck me. Like unbound, I’m not even sure how it came about, but suddenly the word was in my spirit and I knew it was the one. As the word planted itself in my mind, I scrawled it on a notecard and wrote the reference to one of the verses I tucked into my heart at the beginning of last year—Romans 7:6—underneath it. When you become free, the ties that once bound you, that held you captive—whether mentally, physically, or spiritually—must be untied, unbound. 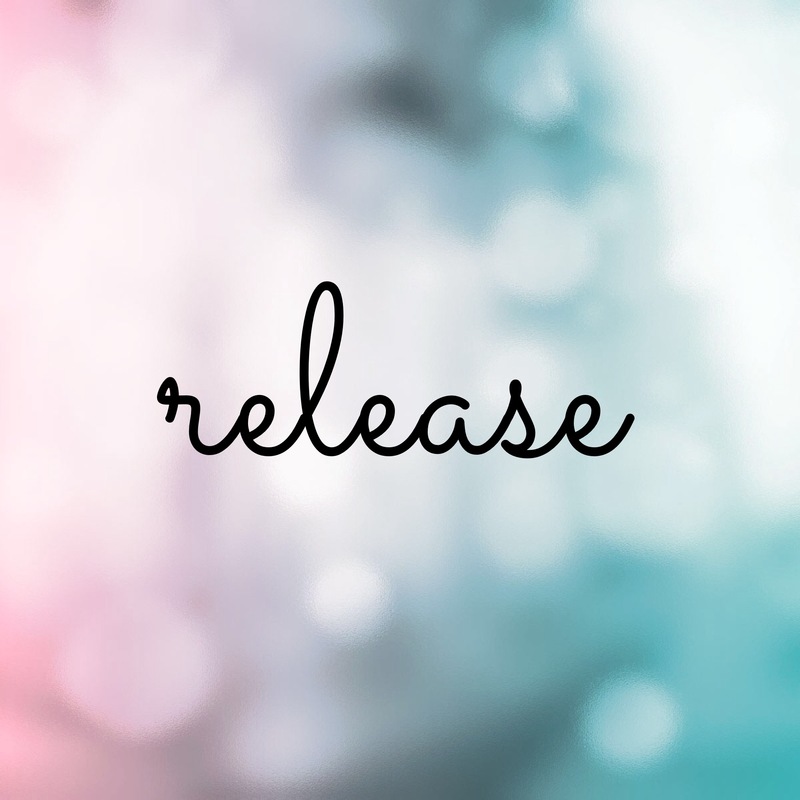 Once they’re unbound, they must be released, because even if they no longer bind you, you cannot be truly free unless you let them go. Consider this: Let’s say Lazarus gets a little help from his friends with unbinding himself from his grave clothes. But he’s eventually left standing outside the tomb. What if he ended up with a fistful or two of the cloth that had bound him in death and the darkness of the tomb. What does he do? Take off walking around town with those (smelly) strips of fabric in his hands? Carry them around for the rest of his days? Or does he drop them as he steps away from the tomb? Does he cast them aside? Does he release them from his possession? I may have been unbound from the chains of depression, and I may be walking a new path, but there are still many things—material possessions, messed-up thought processes, and comfort-zone coping mechanisms to start with—that I’m still holding onto. When you’ve been held captive for a while, freedom is a bit intimidating. But living in-between captivity and freedom is not where I want to settle in—and if I sit back and don’t step into 2017 with the intention of working toward fully becoming who I was created to be, then I will likely remain in that spot. I’ve come too far to keep holding onto those old rags. Which means I have to let them go. So I’m stepping into my RELEASE year.